Join Izzy on her journey from January blues to joy. 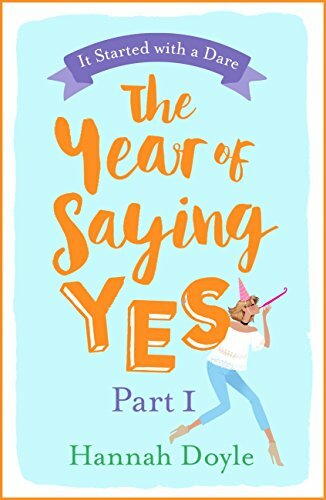 THE YEAR OF SAYING YES by Hannah Doyle will make you dirty-laugh, feel warm and fuzzy, and rediscover life's magic - all thanks to one little word: yes. Fans of Lindsey Kelk, Mhairi McFarlane and Lucy-Anne Holmes, you're in for a real treat. The first of four exclusive part-serialisations of THE YEAR OF SAYING YES by Hannah Doyle. It's drizzling outside, which totally matches my #currentmood. Pigs in blankets, all the mince pies and a festive Baileys or five are distant memories. You know the drill - it's January. Everyone's banning booze (terrible idea) or cutting carbs (impossible). To add to the misery pile, my plans to seduce the man of my dreams at the stroke of midnight flopped spectacularly. I'm Izzy. I don't just need a New Year resolution, I need a whole new life. And I need YOU. My dreary life is about to get a total makeover - it's my 'Year of Saying Yes'. And this is where you come in. It's up to you to #DareIzzy. I'm saying yes to your challenges, no matter how nuts, adventurous or wild they are. The sky's the limit - I'm at your mercy, readers! With a bundle of laughs from the very first page, I knew that I was going to love The Year of Saying Yes Part 1. In a similar vein to Bridget Jones, Izzy's unique voice shouts from every page as we get to know this funny, quirky singleton. Not only is Izzy hilarious, she is also very real and I'm sure that many readers will identify with her. I do a similar thing with names as she does and I am struggling to contain my laughter just thinking about Fittie McNoShirt. This is a great idea for a series of books. Part 1 being January to March, starts with New Year's Eve and Izzy getting ready to see the object of her affection, Gorgeous George. The only problem is, Gorgeous George doesn't know how much Izzy likes him and for the past 3 years Izzy has been hoping that they will finally get together. As she holds out hope that tonight will be the night, George announces that he has a new girlfriend and Izzy's balloon of hope is burst. So instead of making resolutions of things to do in the new year, Izzy decides to make a list of things to say no to - an aptly named to don't list. The To Don't list is flipped on its head when Izzy's editor decides to run a feature on Izzy saying yes to everything with readers suggesting challenges that Izzy has no option but to say yes to. What could possibly go wrong? A fun makeover and a complete switch off mini break sees a remarkable change in Izzy starting to take shape. Perhaps Gorgeous George won't be able to say no to Izzy but maybe it is too late now that Alex, aka Fittie McNoShirt, is in the picture. Hannah Doyle has such a way with words that even someone with no sense of humour wouldn't be able to stop themselves from laughing out loud at Izzy's shenanigans. 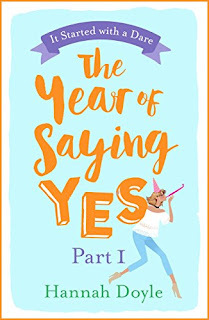 It's so lighthearted, refreshing and fun; I absolutely loved The Year of Saying Yes Part 1, the only thing wrong with it is that it is too short...roll on Part 2.